I can write Polish, German or English, but many of my friend can read/write France, so if you must - you can write to me in this language. This is my found from 2005 / Juli / 03, on fallen cupules of Fagus silvatica. It seems to be Parachnopeziza sp. (??). With Indexfungorum i see - it is a small Genus with 8 taxon. Two next (probably) Parachnopeziza i found on "In vivo veritas" (H.O.Baral CD 2003) as HB 6961-1 / HB 6961-2 and HB 6477d. IF (??) my found is a Parachnopeziza sp. it is NOT P.triseptata, P.miniopsis and P.aquinella. I think, it is NOT (??) P.bambusea, P.guangxiensis and P.sinensis too (growing only in China ??). I think this cannot be a Parachnopeziza, as it lacks the kjind of hairs that characterize the genus, long, and coiled. Why is this not an Arachnopeziza? Typically Parachnopeziza apothecia are not borne on the subiculum, as so many of the photographs show, but rather are on the substrate and may have a subiculum surrounding the apothecia. Arachnopeziza, on the contrary, has apothecia arising on the subiculum in almost all cases. The clavate hairs with swollen apices are not an impossibility in Arachnopeziza, though few described species have such regularly placed roughenings as illustrated in the figured plate. 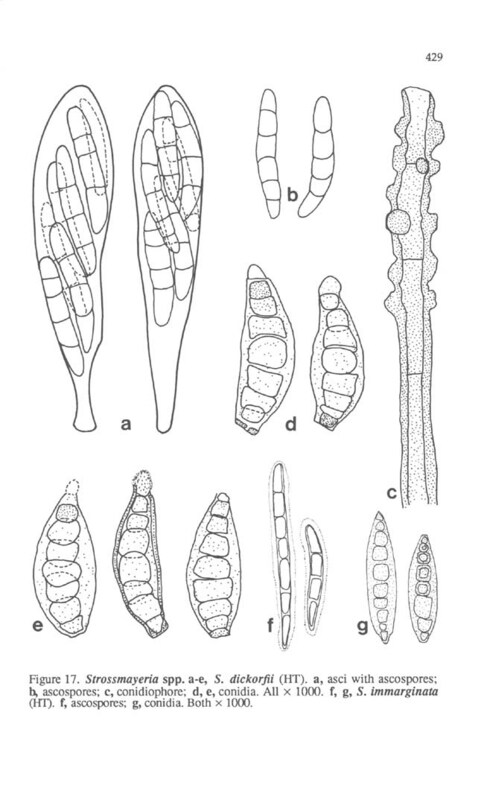 Ascospores in Arachnopeziza are very variable, in many species shorter and with fewer septa. Most spececies with spores in a fascicle and as long as these have 5 or 7 septa. These spores are rather long to have only 3 septa (for either genus), and I did not see much evidence of the septation in the microphotos. The figure shows a 3-septate spore, and states that that is the usual number. It could be, or the iolluistrated spores may be immature, as both 5-septate and 7-septate (at maturity) spore arte earlier 1-septate, then 3-septate, and then either 5-septate or 7-septate. I feel certain that Arachnopeziza is where you should look for your species, if it is described. Since I described Parachnopeziza, I have kept an interest in what has been described there. This just doesn't seen to belong in Parachnopeziza on several counts. I look forward to Zotto's comments. I'm NOT sure, that this is subiculum. So many white subiculum-like hyphae are "growning" on this cupule of Fagus, but ON this subiculum are not fruibodies. Frb. are growning ONLY on SPINES. From one Frb. to another is going (like a net) onlu one thick "subiculum" hyphae. Is this hyphae thick, because is build from some hyphaes (4-7). Thanx for all counts, that means, it is NOT Parachnopeziza. Chm...... Arachnopeziza with immature spores... OK. Many disc-flat fruitbodiem seem like to be fully mature, but MABY (?) if the spores are immature, then at maturity the ascii will be longer? Then maby it is Arachnopeziza delicatura (Fckl) = A.laricina (Velen.)? By A.delicatula asci are 97-132 x 11,7-13 (Baral). I have just looked at your Parachnopeziza. The strongly swollen paraphyses I do not know from Parachnopeziza , at least not from finds I have studied. Couldn´t it be a Vibrisseaceae? That group is often recognizeable by a more or less distinct blue IKI- or MLZ-reaction of the peripheral part of the medulla, between excipulum and hymenium and a bit downwards. The only species in my Vibrissea key with such short 3-septate spores is V. catarhyta. But that species has inamyloid asci. The other (V. norvegica) has already much longer spores. Did the fungus grow under wet conditions? Thanks, Zotto, but the excipular hairs and structure, ascus shape, size and soft structure, etc, all point to Arachnopeziizaceae. Vibrisseaceae would be a long stretch! I agree with Pimpek that it may well be Arachnopeziza delicatula, which is really very close to A. aurata, differning in usually shorter and fewer-septate (3 to 5-septate) ascospores, and typically lacking the pigments sometimes (not always!) evident in A. aurata. The paraphyses are certainly unusual, however. Are we certain those are not excipular hairs? Are they really always that enlarged apically? I am also not very convinced of my idea. 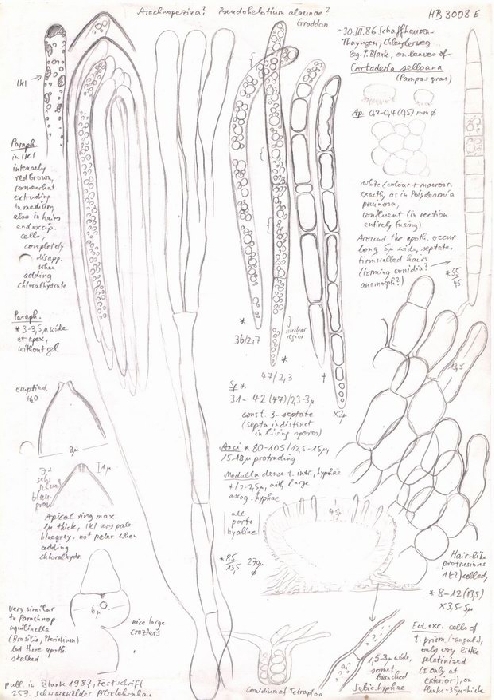 But I have one reason to exclude (P)Arachnopeziza: Pjotr´s drawing of the paraphysis apices shows a greyish interior which, I am quite sure, belongs to refractive vacuoles (VBs) typical of Vibrissea (and the undoubtedly related genus Mollisia). Such VBs are completely unknown in Arachnopezizeae. Maybe it is a filisporous Mollisia rather than Vibrissea. These VBs are often only visible in the living state but not rarely they keep visible in the dead dry material. I quite mayn species of Mollisia and Vibrissea they give a yellow KOH-reaction. Pjotr says "KOH-negative", but this yellow reaction disappears within some seconds so one must be very fast. I don´t see marginal hairs (e.g. in the micrograph of median section) but only clavate marginal cells not untypical of Mollisia (and Vibrissea). In the meantime Pjotr sent me apos of the fungus, and I must confirm it is Arachnopezizeae rather than Vibrisseae. The species reminds me of Pseudohelotium alaunae Graddon (1972, TBMS 58: 149), which seems to be an Arachnopeziza. This is also devoid of hairs at the margin and has similar broad and somewhat monilifrm paraphyses. But in that species the spores are distinctly broader and the habitat is grasses (Deschampsia, Cortaderia). I attach my drawing of a find on Cortaderia. So possibly Pjotr´s fungus is a new species. - this spec seems to be very close to Arachnopeziza delicatula Fuckel (=Arachnopeziza laricina Velen. ), but A.delicatula HAS hairs. The photos of the apothecia this time seem to show gelatinized, translucent apothecia, quite unlike any Arachnopeziza. The ± frequent 4-septate spores are unusual for any discos, where 1-, then 3- then 5- or 7- septate are the rule. I remain puzzled. Another possibility occurs to me: could this be a species of Strossmayeria? I see no sign in the photos of any Pseudospiropes conidiophores, but cultures could estabish this question. There is a nearly white species of that genus, S. immarginata (Pat.& Gaill.) Iturriaga, which indeed has frequently 4-septate ascospores, but the asci are longer than recorded here. 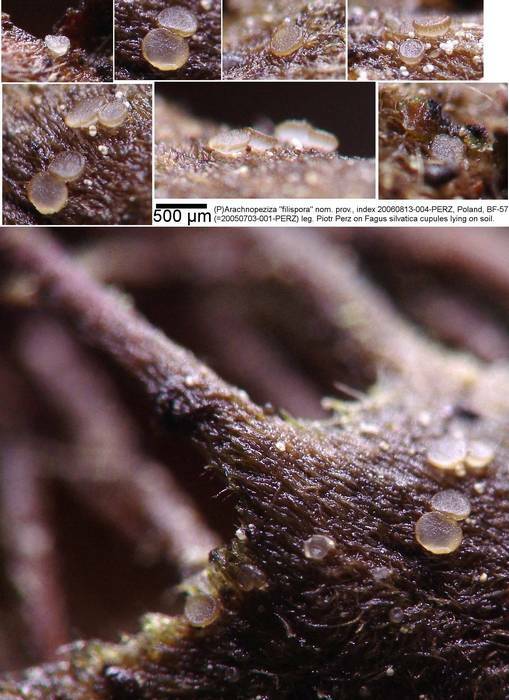 The ascospores should have a gel sheath, but this often disappears in KOH and other mounting media. The only known specimen is the poorly preserved type. 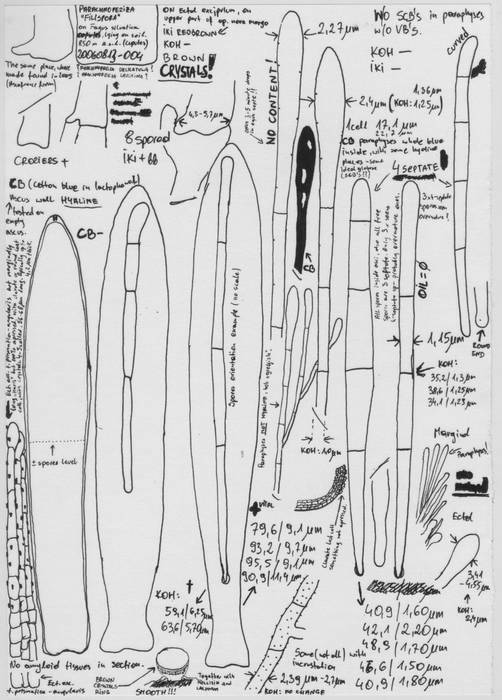 [The description can be found on Cyberliber website, easily accessible from the Mycotaxon home page, www.mycotaxon.com, and by clicking the CYBERLIBER link, choosing "Catalogues and Journals" and selecting Mycotaxon, and then volume 36, and pp. 428-430.] Any chance of culturing this? the spores are allways 3-septate (4-celled). Only some free spores are 4-septate (5-celled) and I think, they are overmatured. Yes - you are right, my drawnings is wrong should be more times 3-septate and only 1x 4-septate on drawning. I have NO chance to culturing :( Zotto is now in Switzerland and I can not send him this species in living state. But it is possible, when he is back may be i find some new Apos and then i can send him. I think Zotto can cultured this. Strossmayeria: http://www.cybertruffle.org.uk/cyberliber/59575/0036/002/0429b.jpg - this 100% is another specie. I am not in a position to culture anything now. Sorry I can't help.